First off, what is Brown Patch disease? Brown Patch is caused by the fungus, Rhizoctonia solani. 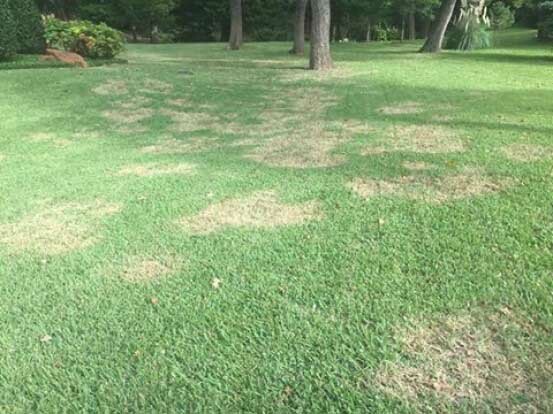 You can spot Brown Patch by the circular brown areas that appear in your turf: St. Augustine being the most susceptible.You will notice small to very large circular patches of grass turning a brownish yellow color. The patches will vary in size, but the browned leaf blades will remain upright, pulling out easily from the runner and resemble straw or hay. Recognizing the signs early on is key to reducing the disease over time. Did you fall victim to this disease last year? If so, what can you expect out of your lawn this spring? With the cool rainy spell that started in August of last year, we saw an uncanny amount of Brown Patch throughout the metroplex. If you are one of the many who dealt with this disease, you are probably noticing that those previously infected areas are still looking pretty lifeless compared to the rest of your turf. Don’t fear! These areas will recover but expect a 2-3 week delay in green up. Although we cannot control the weather, we can control our watering. Excessive moisture and mild temperatures are a trigger for Brown Patch. So, as it continues to stay cool at night and frequently raining – DO NOT WATER! See our watering guide for more detail on this. Are you due for an irrigation audit? A well-run system that is checked yearly can help prevent over and underwatering. By making sure your system is functioning properly you’ll notice: healthier plants, less water runoff and flooding, and a savings on your water bill. If you have questions about scheduling your system or its functionality, you should highly consider an irrigation audit.